Metal braces are typically associated with teenagers, but that doesn’t mean you should have to settle for your crooked smile. More adults are pursuing orthodontic treatment than ever before! Of course, not all adults want to jump into traditional braces if they don’t want to change their image, diet, or brushing habits. That’s where Invisalign in Wakefield comes in! According to your cosmetic dentist in Wakefield, orthodontics isn’t exclusive to young patients. The only reason young people tend to have braces more often is because that’s when they first notice their teeth are coming in crooked. It’s also better to start early if you have the option, but this doesn’t mean you can’t benefit from orthodontics as an adult. All you really need to have is healthy gums and a commitment to practicing daily oral care in between your dental visits. Furthermore, orthodontics don’t only straighten your teeth. In fact, it can also do wonders for your occlusion, especially if you already have jaw pain caused by a poor bite. Misaligned teeth distribute force unevenly, causing stress on the temporomandibular joint. Invisalign can help improve your bite and reduce these symptoms. Invisalign utilizes clear and customized aligners that match specific stages of your realignment. These FDA-approved cosmetic braces replace metal brackets and wires entirely, helping you realign teeth without needing to hide your smile in photos or during other public events. This way, you don’t have to sacrifice your image just to improve it in the process. Each pair of aligners is designed to apply small amounts of force to your teeth. You’ll wear each pair for about two weeks at a time, switching to the next pair in the series and visiting your dentist every six weeks or so. This allows your dentist to check your progress and confirm everything is shifting as planned. 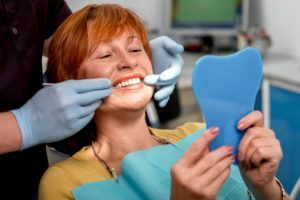 Your dentist designs your treatment plan from start to finish using 3D computer imaging, so he’ll know if adjustments are needed. The length of treatment largely depends on your commitment to wearing the aligners. While the average treatment time is 12 months, a far cry from the minimum of 18 months required by traditional braces, it could be longer if you don’t wear the aligners for at least 22-23 hours per day. The longer you wear them, the shorter treatment time will be. The only time they should be removed is for oral care, eating, and the occasional photo op; just don’t forget to wear them after you’re finished! With Invisalign in Wakefield, you can get a straighter, healthier smile in less time and more conveniently than ever before! Schedule a free consultation to see if they’re right for you! Dr. Rob Schumacher earned his dental degree and training from the University of Kentucky and the University of Michigan. As a prosthodontist, using Invisalign is just another way to help patients through cosmetic and restorative dentistry. To learn more about his practice, contact him through his website.